All race communications take place on VHF channel 71. This is the first race of the year. Shake off that grogginess from last night’s party by going out on the water. Race between CPYC and Hunter’s Point (course to be determined). Two divisions: Double handed and full crewed. In memory of John Pitcher, a CPYC sailor who passed away while racing aboard his Pearson in the late 1960’s. The race is open to ALL boats berthed in Coyote Point Marina, whether the boat owners are members of not. In memory of past commodore Andrew Byrd (1947-48) and a founding member, Andrew Byrd was one of the members responsible for securing the original clubhouse and the land. The perpetual trophy race began in 1976; regardless of the winner’s club affiliation, the trophy is to always remain at Coyote Point Yacht Club. Mr. Ballentine was a “legendary” racer at CPYC, and a very competitive one at that. In memory of past Commodore Merton Yolles, who loved sailing his Ericson 32, “Tranquility.” Mr. Yolles was killed in a pedestrian-auto accident in 1973. His family donated the trophy, which hangs on the wall of the regatta room. An Independence Day weekend tradition. Dave and Kay Few were active sailors throughout the 70’s and 80s. In this race, a woman must be at the helm at least 50% of the time of the race, and the crew must be at least 50% women. The oldest of the CPYC regattas is named for Gustav Barth, one of the founding members of CPYC. Barth provided the trophy specifically for the purpose of attracting North and Central Bay boaters to the South Bay. By the 1950s, the race had become a popular activity, with sometimes over 50 boats participating. As demographics and interests changed, the Barth race too, changed course. It is now a friendly competition between Sequoia Yacht Club and CPYC, with each club hosting the start on alternating years. The race is scored on a point system, based both on which club has the winning boat and which club has the most entrants. Jerry O’Grady was a “living legend” of single handing, and could often be found sailing his boat on almost every day of the year, rain or shine. Even his boat was named Solo, which he sailed out the harbor and towards the airport on a near-daily basis. One day, he sailed out the gate to the lightship and back. Jerry O’Grady passed away in 1990, and the race was named in his honor. First held in 1980, the race is traditionally held in the fall, as the commodore’s term nears completion. The race is held over a course that is “sometimes weird,” and the current commodore is always asked to sail on the previous year’s boat. The race concludes with a dinner (a “roast” or tribute dinner) in the commodore’s honor that night. Most races in the Interclub series take place in the South Bay, with starts off of Alameda. This great series is open to members of Aeolian YC, Alameda YC, Catalina 34 Fleet 1, Encinal YC, Island YC, Oakland YC, South Beach YC, Treasure Island YC, BAMA, Ballena Bay Yacht Club and of course, Coyote Point YC. All yachts with a valid NCPHRF rating. There should be a NCPHRF certificate for either your boat or an identical sister ship which will be accepted. Boats may be reassigned to alternate divisions after registration in order to balance the divisions and may be combined if there are too few for a division. A minimum of 3 boats will be required for a division. In the event there are only enough boats for one division it will be raced non spinnaker or re-sailed at a later date. Check the CPYC calendar for Skipper’s meeting time. Skipper’s meetings will usually be at 11:00 am for a 1:00 pm start. Check-in at Committee Boat is acceptable. Committee Boat will monitor VHF Ch 71 throughout the race. Communication is encouraged. Retirement from the race without finishing requires RC notification. Scoring will be calculated Time on Time, except for pursuit races. CPYC will provide division awards for boats winning and placing in the individual races. Perpetual Trophies remain the property of CPYC with winners’ names engraved on the trophy. An awards dinner will be held at the end of the season – exact date and time to be determined at a later date. Checks should be made payable to Coyote Point Yacht Club. After the race, come relax with your fellow sailors at the CPYC clubhouse and bar! Events after each individual race will vary, but may include cookouts, potluck dinners, live entertainment, etc. Details will be announced prior to each race. Race results will be announced after the race (assuming no pending protest). Skippers: In order to participate you must either register on www.jibeset.net or complete and sign the Skipper_Release_Form_2016 prior to racing. Crew: All crew members must complete and sign the 2016 Crew Release Form prior to racing. 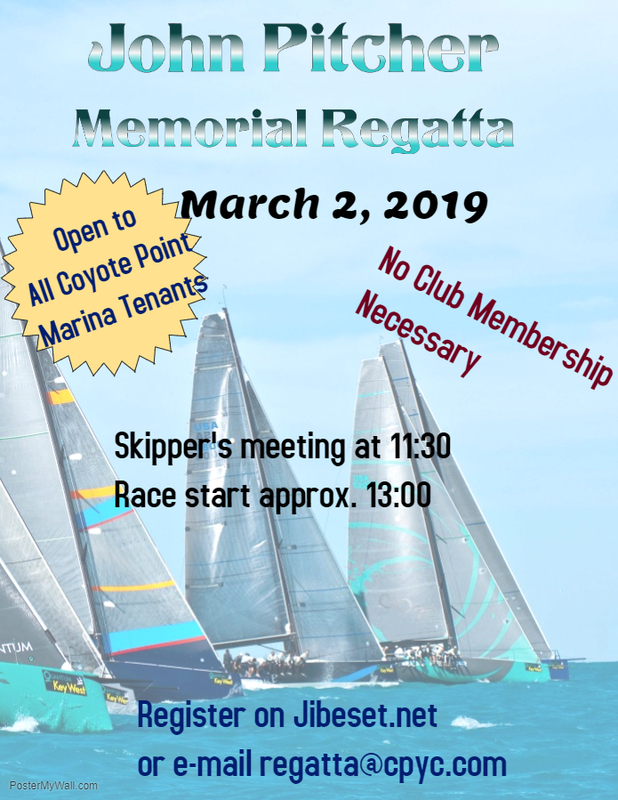 Please complete these form and either bring them to the skippers meeting or email to regatta@cpyc.com no later than the day before the first race. Length Spin Pole: _____ ft. I certify that I have done nothing to my boat to invalidate the above rating. I also agree not to sue CPYC or any Member involved in planning or running these events. I assume liability for my crew and boat.